Quezon City – The color purple is often associated with royalty, grandeur or prosperity. In culinary circles, purple is the latest food fad. A plate filled with purple carrots or potatoes seem to be the latest additions to fashionable menus in a number of restaurants worldwide. In the Philippines, purple is a popular color among many of its delicious desserts, a hue produced by a purple tuber locally called ube. Ube with a scientific name Dioscorea alata is popularly known to the world as purple yam. It is a type of yam, an edible starchy tuber of a climbing plant commonly distributed in tropical and subtropical countries. It has a beautiful purple interior and a reddish brown skin which can be used as a raw material for the production of food coloring. First cultivated in Southeast Asia and promulgated across the continents, it is one of the high-value crops in the Philippines because of its nutritive value and the variety of processed products which can be made out of it. Filipinos love to eat and always considered eating as a pleasure. Most people have sweet tooth with each meal ending with “pang himagas” or dessert. A delectable and creamy confection most cherished by Filipinos is “ube halaya or ube jam”. It is a concoction of slowly heated purple yam and coconut or condensed milk stirred until the mixture thickens. It is use to flavor ice cream, cakes and other pastries. Halo-halo on hot summer days will never be the same without ube halaya and ube ice cream for its rich flavor while its stunning bright purple color make the dessert more appealing. Ube is not mainly for desserts alone, these days a dish which features this purple root crop is becoming popular. A palatable menu called ‘sinigang sa ube’ which combines the sourness of the soup and the creaminess of ube is a big hit to many Filipinos. It is the purple version of the famous ‘sinigang’ that uses ube as the thickener of the soup. Ube is prepared in various ways including boiling, drying, and soaking and marketed in the forms of powder, puree, dried chips and many others. Due to its high market demand of at least 49,000 metric tons a year, the Philippine Department of Agriculture initiated a project to increase its production and have an ample supply of ube both in the country and abroad. The increasing demand for fresh tubers comes mainly from Luzon and a few from Central Visayas and Northern and Southern Mindanao where major food processors operate. Foreign countries like Canada, Australia, US and other European and Middle Eastern countries demands for processed yams. 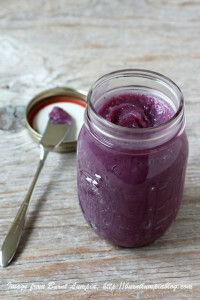 As delicious as it is ube has many health benefits that improve overall health. Studies suggest that it is a good source of fiber that improves digestion, minerals that help the body’s metabolism process, rich in antioxidants helpful in detoxifying vital organs as well as potassium that aides the body to more healthy and strong. Its purple pigment is also known to be a great source of anthocyanin which is considered a flavonoid which has potential beneficial effects against cancer, aging and neurological diseases, inflammation, diabetes, and bacterial infections. Important celebrations for Filipinos like Christmas and New Year are not without this purple royalty for many consider its color as a good luck. A media noche (New Year’s Eve) table is not complete without ube halaya alongside the tradition of 12 round fruits to signify prosperity in the coming year. Looks like purple is here to stay not just in the Philippine gastronomy but to the world as well.